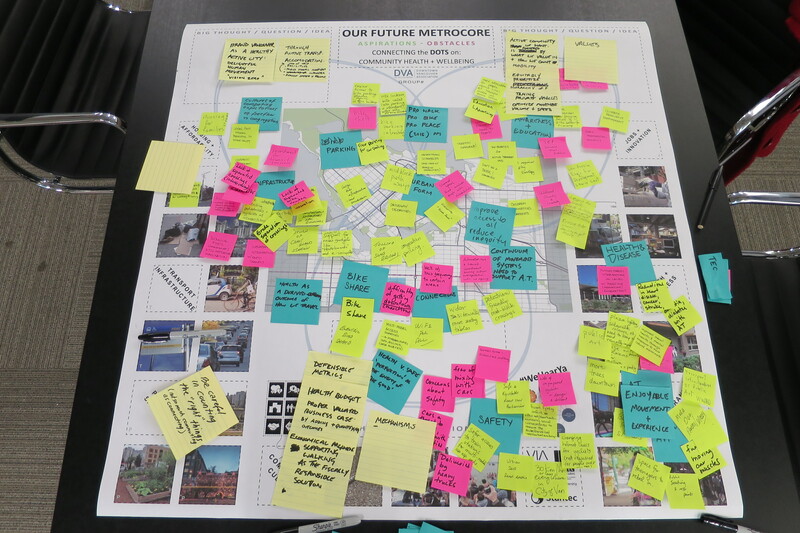 On December 9, 2015, the DVA held its sixth in a series of Metrocore Quilting roundtables exploring the connection between this year’s subject area Health and Wellbeing and some of the key components of successful city-making. The goal is to generate a “quilt” of insights leading to inform the development of a DVA advocacy strategy on the subject of Health and Wellbeing. The December 9 roundtable hosted by VIA Architecture brought together participants involved in the realm of active transportation to explore the shared understanding between residents, businesses, and community organizations that can help us inform our position on health and wellbeing in Vancouver’s Metrocore. Health budget – Proper valuated business case by adding and quantifying outcomes. Economical argument – Supporting walking as the fiscally responsible solution. “Vision Zero” through active transportation. Accommodation – End of trip facilities, trans modal movement, infrastructure and speed and volume reductions. Active community is fostered by what we value and how we count mobility. Equitably prioritize hierarchy of transportation, taming private vehicles to optimize movement, volume, and speed.